The Traditional Riser Kit with Concealed Outlet Elbow from the Downton Abbey Brassware Collection has a 12" in diameter shower rose and a beautifully crafted additional handset, finished in chrome with a white ceramic handle. 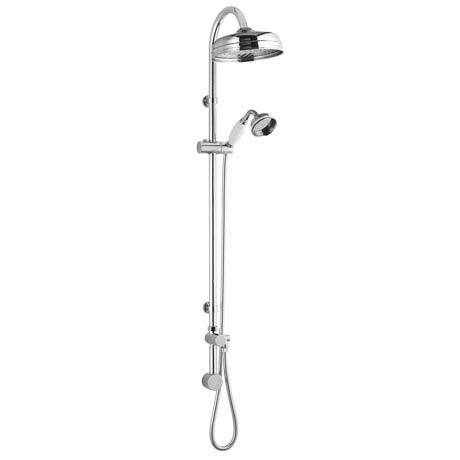 Features a built-in diverter so you can switch between the fixed head or hand held shower. Combined with a concealed shower valve (sold separately) this riser shower kit enhances the appearance of any bathroom. Built-in diverter so you can switch between the fixed head or hand held shower. Suitable for use with concealed shower valves (sold separately).